Love Tester game – take the Love Test today! Love Tester game – take the Love Test today! - Does he love me? Will she fall in love with me? The love tester calculates your and your crush's love compatibility. Would you and your crush make a good couple? The free Love Tester calculates your love compatibility. Enter your and your crush's name and the Love Tester will calculate your love compatibility. The Love Test calculates your love compatibility. See all names your friends enter in the Love Test. Do you want to know if you and your crush could become a couple? Or maybe just a hook-up or a fling? The compatibility meter calculates the likelihood of you and your crush getting together! Using high quality likeability metrics and name compatibility statistics, we can calculate the likelihood that you and your crush will indeed get together. 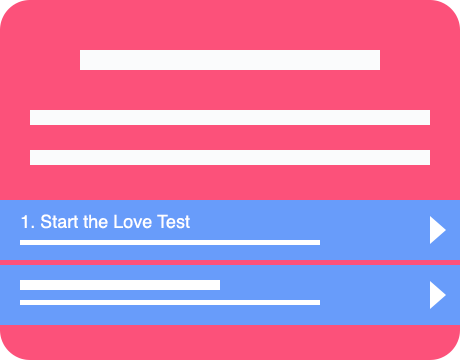 To get started with the love test, click the link above: "Start the Love Tester" and see if you and your crush are meant to be together.